This is Christian Aid Week (13-19 May)! Didsbury Baptist Church, along with other local churches, will participate in the door-to-door collection for our area. We will also take up a special offering in church. If you cannot give in these ways but would like to make a contribution, you can donate on-line at the Christian Aid Week website here. 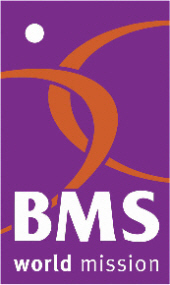 After a great event with Christian Aid last night, we are gearing up for the visit tonight of Fiona Welsh, our BMS World Mission link worker (Mozambique). Fiona is visiting South Manchester link churches: Newall Green Baptist Church, Union Chapel Fallowfield, and ourselves over the weekend. Tonight’s will be a largely social event in which Fiona will make a presentation about her work. It begins at 7.30pm and people from Union Chapel and Newall Green will join us. If you are near Didsbury tonight, come on in, we would love to see you. All are welcome. Fiona will continue her visit by speaking in the morning service at Newall Green Baptist Church tomorrow at 10.30am. Again, all welcome! Earlier today I met with Anne Hillier and Dave Hardman to make plans for the presentation that will be given here on Friday. Come and discover what Christian Aid is doing around the world; it will be a great night. 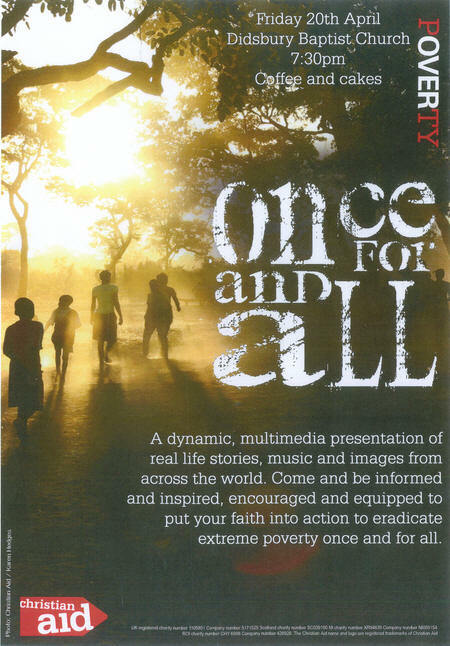 On Friday 20 April at 7.30 pm the Christian Aid Presentation Once and for All will be given at Didsbury Baptist Church. This exciting multi media event shows what the world looks like through the eyes of the poorest people, and what each of us can do to help those in poverty out of poverty. Using powerful personal stories, stunning images and beautiful, original songs Once and for All reveals how our prayers, actions and donations are bringing hope and healing to those crippled by poverty all over the world. Packed with encouragement and audience participation the show will equip us all to put our faith into action and to work to eradicate extreme poverty once and for all. Join us on Friday and be inspired to act! The Crucified One has been raised! Easter morning at DBC was wonderful! I know, I should not be the one to say so because I led the service and was at the wrong side of the lectern to offer an objective view. But what made the service wonderful had little to do with me. The music and singing was full of inspiration, beauty and power. (Thanks to our musicians, singing group, soloists, children’s percussion section and a responsive congregation!) We read some of the greatest words of scripture and we received Communion on the most significant day of the Christian year. The congregation is always interesting on Easter Sunday. While many of the regular members are away, we are always augmented by visitors and friends. We begin the day with an Easter morning breakfast and perhaps this helps to set the tone of celebration and joy. Or perhaps it is just that everyone knows that on Easter morning we celebrate the resurrection of Jesus so they come to church ready to give thanks and rejoice. Well, there was certainly a great atmosphere on Sunday. (If you were there, you were one of the reasons why). It was a great joy to welcome and meet congregation members new and old. My message was based on Mark 16, the major reading for the day. We are reading the Gospel of Mark together at DBC this year and I have been finding it particularly rewarding. I would love to think I did justice to Mark 16 on Sunday but I am sure that, in fact, I did not; (I am not sure that anybody could). I concentrated on the sudden and open ending of the Gospel that seems to invite the readers to continue the story of Jesus in the daily living of their own lives. I don’t think I made enough of the words of the young man in white who met the women at the tomb. ‘You are looking for Jesus of Nazareth, the Crucified One; he has been raised, he is not here . . .’ (Mark 16.6). Sometimes, especially on Easter Sunday, we are so taken up with resurrection that we forget the cross. It is as if we have moved on. The cross is no longer important and all that matters is that Christ was raised. Yet in Mark’s Gospel the resurrection narrative is so short and the passion narrative so long that the reader is left with the abiding impression that, important as resurrection is, the crucifixion remains central. The words of the angelic figure confirm this impression. It is specifically the Crucified One who has been raised. The reader and the church is called to follow in the way of a crucified Messiah. The church is called not to arrogant triumphalism but to self-giving service. Here the risen Lord is to be encountered. I hope our congregation heard something of that message on Sunday morning as we also heard of the new hope offered to all, even to disciples who, like Peter and the rest, had already failed but were not forsaken! We are reading the Gospel of Mark together at DBC this year. It tells a strange and wonderful story of the life of Jesus and devotes a full 6 of its 16 chapters to the final week of Jesus’ life. It presents the events of the passion of Jesus as occurring over specific days of the week. This, of course, provides a useful plan of readings for Holy Week. I know, if you start now you have a bit of catching up to do (and today’s reading is the really long one). Still, you might be interested in reading with us through the rest of the week so here are the readings: Sunday: Mark 11.1-11; Monday: Mark 11.12-19; Tuesday: Mark 11.20 – 13.37; Wednesday: Mark 14.1-11; Thursday: Mark 14.12-72; Friday: Mark 15.1-47; Sunday: Mark 16.1-8a. If you click on the reference you will be able to read the passage online. Some of the passages are quite long but you get Saturday off (and the final chapter is tiny) so why not give it a try? 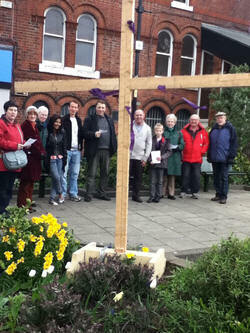 Churches Working Together in Didsbury have erected a cross on the land next to Caffe Nero in Didsbury. This week is Holy Week and each day there will be a gathering at the cross at 1pm for a few minutes of prayerful reflection. A few of us met there for the first time today. The photo shows part of the group; I recognise people from four different churches in our area. Further details of this week’s programme can be found on the CWTiD website. If you are in the area and free at 1pm on any day of this week, please join us; you would be very welcome.